It’s 8:45 Monday February 20th. I’m still laying here in bed, waiting for my coffee to finish and willing myself to get up. Michelle is still asleep and Julia is up and moving around. 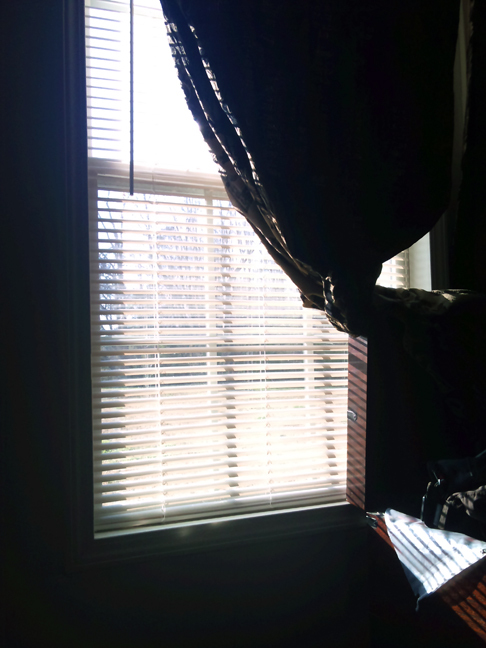 The sun is shining through my window, teasing me into thinking its nice and warm outside. What a lie that is. Heading into Jacksonville for a dental appointment for Julia then off to the mall for Michelle. I have to be back home early, and try to catch some shut-eye before a two night rendezvous with work. This past weekend was fun. Scearce & Ketner are truly my favorite local band. They always put on a great show and are the nicest guys too hang out with. A very unexpected customer was in the crowd as well, shocking me with his presence. I’m at a lost for words at the moment just thinking about it. Very odd? It’s weekends like that, that I wish I could have more often. One can only hope right? Well I think my coffee is done, and I do have to get up eventually. So here is to a great day, and looking forward to whatever may come in the near future. It’s Valentines Day today and of course to me it’s just another day. A day of cleaning, relaxing and just enjoying my own company, which I have grown accustomed to. I’m ok with it, and actually prefer it at times. Tonight will be me and the girls, a nice dinner and a movie. Who knows, maybe next year I will have someone to share this day with. I have this weekend off and finally I can catch Scearce & Ketner at Church Street Pub on Saturday. I haven’t been able to catch them in town because of work, and other prior commitments. This should be a relaxing weekend. I think we might venture out to Fort Macon and mess around out there. I have a project that my nephew sent me, Flat Stanley, I’m sure some have heard of him. I’m having a little too much fun with it, so he will be roaming around with us everywhere we go this weekend. I’m going to try to take advantage of everyday that I have off, because here soon it looks like I may not have much time on my hands for a while. I’m not worried, everything has to change, and I hope that this will all come together smoothly and will be a big advantage and not a failure. So on another point, Julia completed her All County Concert this past Saturday and they all were amazing. I know she has a very big and bright future ahead of her. As for Michelle, she is working on a play for school called State Fair which will be the first part of May. I’m looking forward to that as well. Both are very busy with soccer, Young Marines, and school activities, which keep me on my toes to find transportation to and from these events when I’m working. This is big task all in its self. So with that being said, I’m going to sign off and pick up around this house while I can. Back to work tomorrow, hoping for a good day and it goes by quick. Happy Valentines Day to all, may God Bless Each and Everyone of YOU!!!!! !